Habit: Annual; generally glaucous, glabrous or hairy proximally. Stem: (1.2)2--6(7.5) dm. Leaf: proximal cauline 2--5.5(6.5) cm, lanceolate to oblanceolate; distal cauline linear, sessile, entire. Flower: sepals erect, 2--4(5) mm, lateral pair base +- sac-like; petals (3.5)4--6(7) mm, 0.7--1.1 mm wide, spoon-shaped, crinkled, clawed, white to +- yellow, purple-veined; stamens 4 long, 2 short. 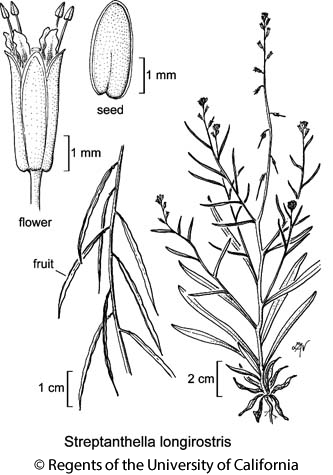 Fruit: silique, dehiscent except near tip, (2.5)3.5--6(7) cm, 1.5--2(2.2) mm wide, linear, flat parallel to septum, unsegmented, tip narrowed to beak (2)3.5--6(8) mm; stigma entire; pedicel recurved to reflexed, (1)2--5(7). Seed: (12)16--28(34), in 1 row, 2--3 mm, flat; wing 0.3--0.7 mm wide. Chromosomes: 2n=28. Citation for this treatment: Ihsan A. Al-Shehbaz 2012, Streptanthella longirostris, in Jepson Flora Project (eds.) Jepson eFlora, http://ucjeps.berkeley.edu/eflora/eflora_display.php?tid=45704, accessed on April 24, 2019.
s SnJV, SCoRI, GB, D; Markers link to CCH specimen records. Yellow markers indicate records that may provide evidence for eFlora range revision or may have georeferencing or identification issues. Purple markers indicate specimens collected from a garden, greenhouse, or other non-wild location.